So, I was thinking that we all have bits of memorabilia connected to Oak Island which we hold dear and probably have on our shelves at home. It may not be as splendid as this, and if you're like me, it's probably just be a pebble from Smith's Cove which sits proudly on your bookshelf. I have a piece of rock which I found on the path that runs from the MP to the Welling triangle site, and a couple of oak tree leaves which I keep in a plastic bag between two large books. Quick pass me a spade! I`ve had another idea. I would like to contribute the images of a very old postcard. The front shows a vintage shot of the money pit, unfortunately there is no information available, but I am guessing that this would have probably been late 1800's, perhaps the turn of the century. Maybe Mrs. Daupine is one of the ladies in the picture...lol. "Have been on this island looking for "treasures". There have been many others disappointed so I don't mind so much my failure. Hope to see your "cutie" soon....With love to all ....S.L.W." 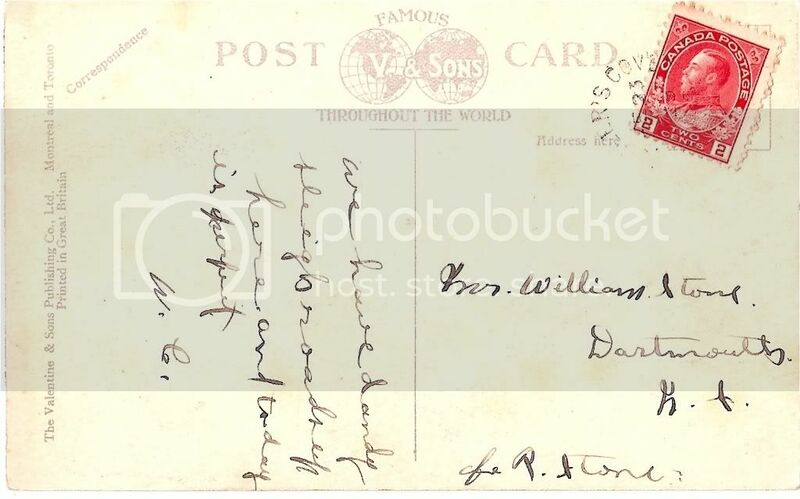 This postcard has gone out to auction, so perhaps one of you lucky collectors out there actually owns this now! 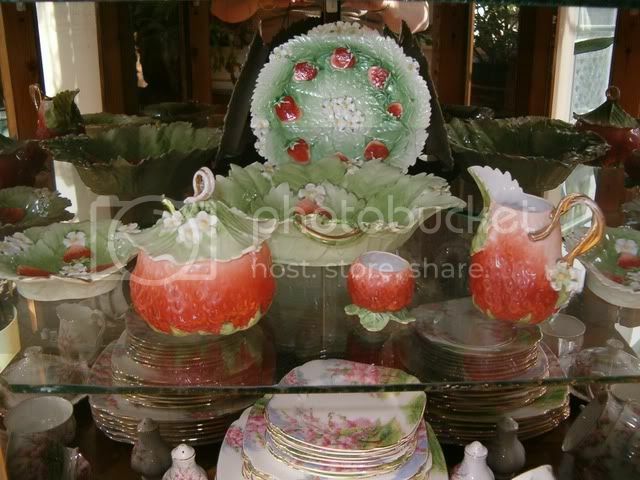 I was given the images by the former owner. Last edited by mutakwe on Mon Feb 09, 2009 10:04 pm, edited 3 times in total. 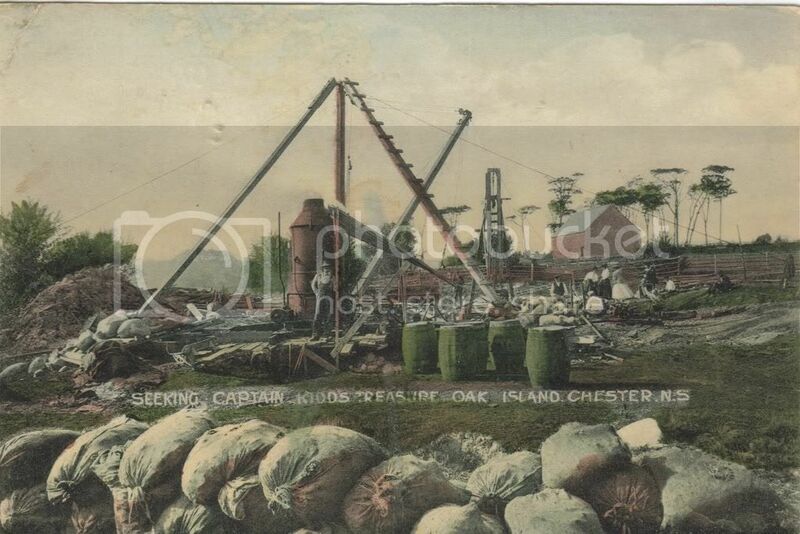 Please see above, yet another image of Oak Island in earlier years from my own collection. 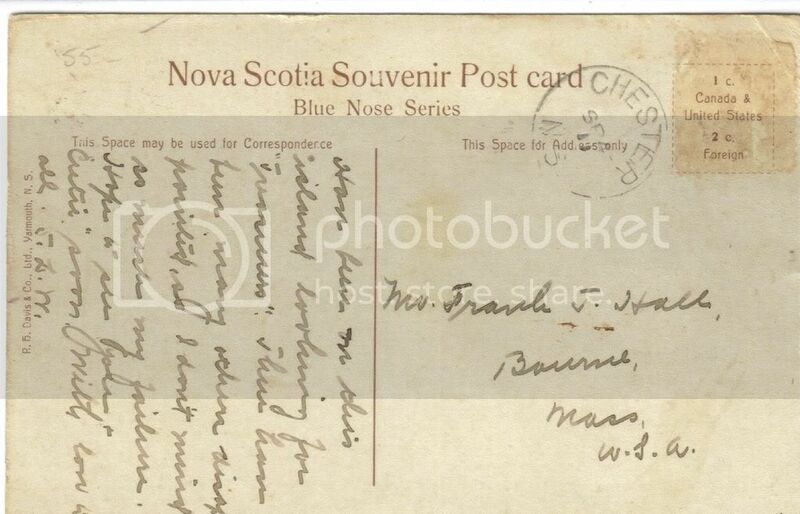 I would like to call on D'Arcy to help me, (or any of you learned Oak Island enthusiasts), with the signature on the back. The note says, "We have dandy sleigh roads up here and today is perfect!".....W.C. My question is....look at the signature...W.C....could this have been William Chappell? My many pleasant memories of the thousands of people who I have helped introduce to the mystery of Oak Island. mutakwe wrote: My question is....look at the signature...W.C....could this have been William Chappell? I'd guess that you're probably correct, judging from the sepia photos (and a 2-cent postage, no less!) 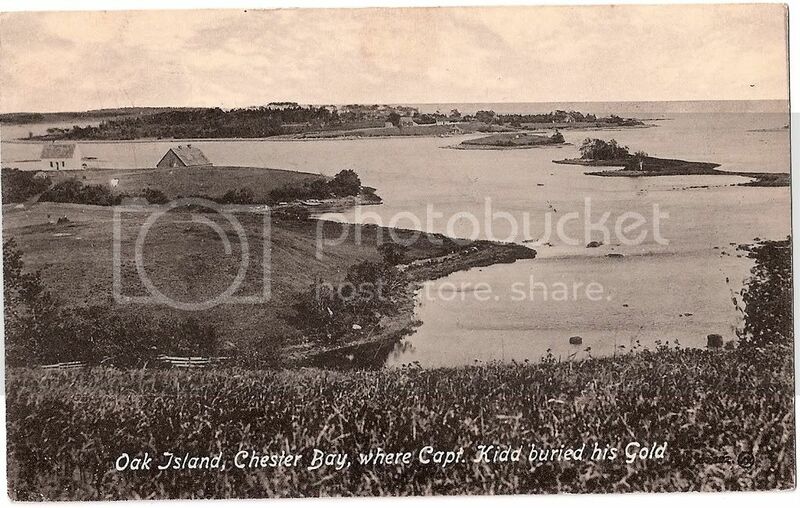 that the card originates from the late 1890's when William Chappell was a major shareholder in the Oak Island Treasure Company, and visited the island on a regular basis. Well that is encouraging news, I must get a copy of W.C.'s known signature and compare. See, you really never know what is going to come next when it regards Oak Island. Anyways, thanks very much. Joy PS...If that stamp on the card is King Edward the VII, then he would have ruled from 1901-1910. Hmmmm I know this will be hard to believe but I actually have one spare bedroom with my growing Oak Island mystery collection of books, framed posters and stuff. I have bore hole core samples. (No not corn hole bore samples )My Dan B's poem framed. Commemorative 3x5 card w/stamp with a pressing of wheat under glass. Stamps commerating the mystery and that were made in various countries I think I have to look. There are a few amoungst us who have serious stacks of Oak Island cool stuffs in there possession, eagerly hawking/monitoring the EBAY air waves(not me, I can't figure it out). I am very happy with the simple stuff I have and it gives that room character. Of course I always want more. It has been called my "Oak ISland room" and over the years I have been fortunate that a few Oak Island dignitaries have allowed me to reciprocate their hospitality and graced my humble abode and stayed there (I hope left 10 pounds heavier, ). Whewww...where does the time go! Location: New England and relatively close and accessible to Nova Scotia.